If you are a fan of railroading in the Santa Cruz area, you have probably seen one of our videos. While we do produce other railroad related content, the bulk of Treefrogflag Productions’ YouTube Channel is comprised of videos from the Santa Cruz area. 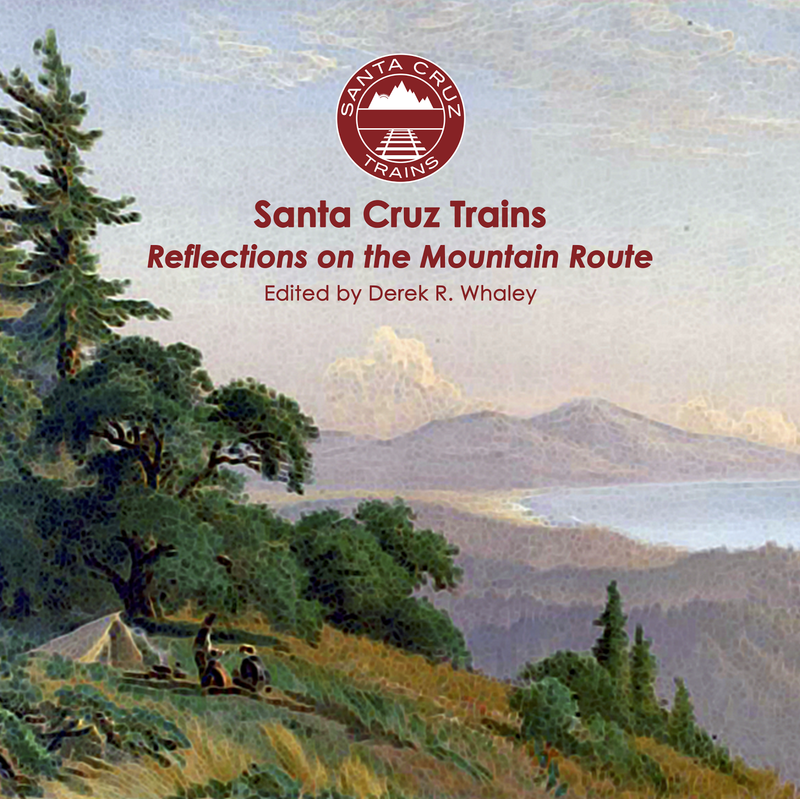 We’ve covered everything from the evolution of the Santa Cruz Branch line to the continuing saga of Roaring Camp Railroads. However, Treefrogflag Productions came from humble beginnings. 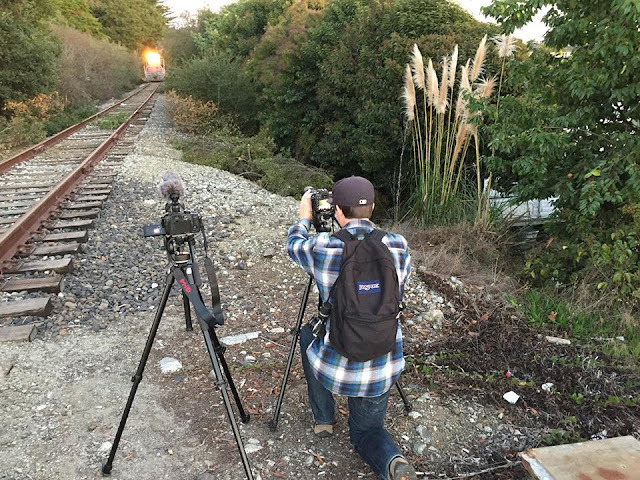 Paul Nolan sets up his camera next to Trevor's camera for the very first day of filming for "Passenger Trains return to the Santa Cruz Branch" on April 17, 2015 for Treefrogflag Productions. Photograph by Trevor Park. I started the YouTube Channel back in 2008 so I would have a place to post my very rudimentary Roaring Camp videos. I was into flags at the time and had a tree frog as a pet. For some reason I couldn't think of a good name that was related to trains, so I decided to call the channel Treefrogflag. While these early videos were not even 1% of the quality of our current content, it was a good start to something great. I ran the channel for many years on my own until around 2013. At this point, my friend Paul Nolan, who had been running his own YouTube Channel, had the grand idea of combining our growing production skills and making videos together for Treefrogflag Productions. 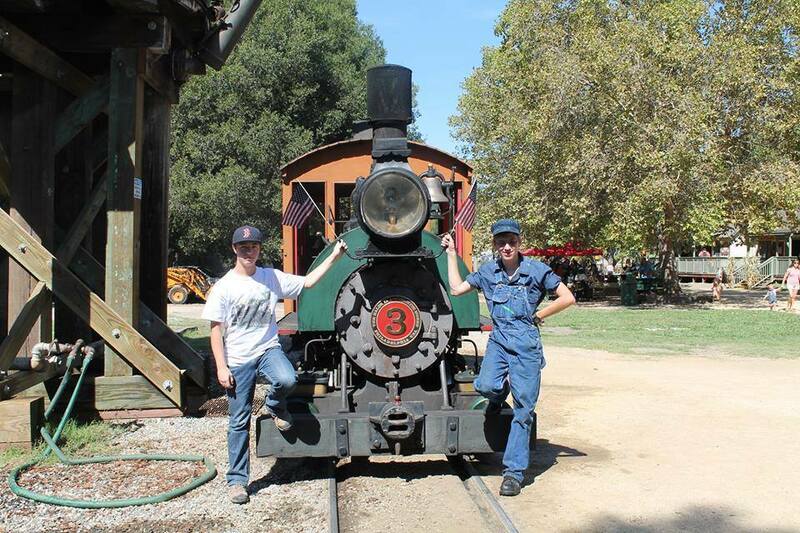 Trevor Park (right) and Paul Nolan (left) stand in front of Roaring Camp Railroads engine #3, Kahuku. Photograph by Phil Reader. Paul and I have known each other since we were two years old and Paul actually grew up next door to my aunt. They both lived directly across the street from the Santa Cruz Branch line, which saw three round-trip trains a week when we were little kids. Paul and I have very fond memories of watching the Santa Cruz local going by, one of the many reasons why we both got the railfan bug. He and I both thought it was a good idea to make train videos in our spare time, but it was only once we combined our video skills that Treefrogflag Productions really became something. Our first collaborative project happened to be a video on the 50th anniversary of Roaring Camp Railroads, when all four steam locomotives were rolled out of the shop under steam as a celebration for the railroad’s birthday. We loved the way this project turned out so much that we continued making videos together. Paul and I have since made many releases, the most popular of which today is our "Trains Return to the Santa Cruz Branch" video (2015) that shows the first train on the Santa Cruz Branch since the rebuilding of the La Selva Beach Bridge. It is extremely rewarding for us to be able to make videos that people enjoy watching and hopefully learn something from. We love being able to share our passion for railroading through our videos, and we hope you will go check out the channel soon! You can find our YouTube channel at this link: www.youtube.com/user/treefrogflag. And you can like us on Facebook here: www.facebook.com/TreefrogflagProductions. Sometimes when writing history, not all the information is there when you need it. As I wrote Santa Cruz Trains: Railroads of the Santa Cruz Mountains, the Potrero District was an evolving beast. I was never entirely happy with it but the article had to be finished. A few months later, information from Newspapers.com, an old Southern Pacific stations book, and Michael Luther, an author of Limekiln Legacies, revealed the otherwise undocumented earliest patron of the Southern Pacific Railroad in the Potrero District. The following information, a "deleted scene" from my book that belongs near the top of page 53, is the product of Luther and my research on the topic from mid-2015. In March 1877, the Santa Cruz Portland Cement Company established its base of operations in Hiram Abiff Imus’s orchard, immediately next to Gharkey’s orchard and the Santa Cruz & Felton Railroad right-of-way near modern-day Pogonip Open Space.1 Popularly known as the Santa Cruz Cement Works, the company had a shaky and ultimately failed existence in the county from the beginning. In 1895, the Cement Works property was sold at auction to the mortgagee, the San Francisco Theological Seminary, with a portion sold to S. Eppstein.8 A remaining section of the property was put up for sale five years later and sold to A.H. Fitch, who demolished the remaining machinery and buildings before putting the property back up for sale.9 The last trace of the Cement Works was gone from the city. An editorial eulogy for the Cement Works was published by the Sentinel on August 10, 1900, describing the sorry history of the facility and concluding the 23-year legacy of the Santa Cruz Portland Cement Company.10 One of its last vestiges, the railroad siding, probably lingered beside the mainline until around 1907 when the Southern Pacific standard-gauged the tracks. A few years after the Santa Cruz Portland Cement Company shut its doors, a new company under the same name opened in Davenport, soon afterwards returning Santa Cruz County to prominence in the Portland cement market. Few people then knew or remembered this first failed attempt to make Santa Cruz the Portland cement capital of California. The site of Cement Works is now the Granite Rock Company’s facility on Coral Street, which has its own now-abandoned spur. 1. SC Weekly Sentinel, 09/29/1877, 3:5; ibid, 03/12/1881, 2:3. 2. SC Weekly Sentinel, 10/12/1878, 2:2. 3. SC Sentinel, 06/28/1893, 2:2. 3. SC Sentinel, 08/10/1900, 2:2. 4. SC Weekly Sentinel, 01/08/1881, 3:1. 5. SC Sentinel, 02/14/1888, 2:1. 6. SC Sentinel, 04/01/1891, 1:1. 7. SC Sentinel, 01/03/1895, 3:1. 8. SC Sentinel, 04/24/1900, 2:6; SC Evening Sentinel, 05/02/1900, 3:1. 9. SC Sentinel, 08/10/1900, 2:2. The clean-up of damage caused by the January and February storms that wrecked portions of the Santa Cruz Branch line between Watsonville and Davenport continues in earnest by Iowa Pacific Holdings and the Santa Cruz County Regional Transportation Commission (RTC). Numerous downed trees, washouts, and sinks caused by the storms still need to be removed or repaired before regular service along the line can resume. Howard Cohen reports that negotiations continue between the RTC and the Pajaro Valley berry farmer whose backed-up culvert washed out a significant portion of the right-of-way near milepost 5. At the April 6 meeting of the RTC, the commission adopted a resolution to seek funding from the Federal Emergency Management Agency (FEMA) to help repair the right-of-way. Naturally-caused damage to the line is outside the commitments of the Santa Cruz & Monterey Bay Railway and, therefore, the responsibility of the county to repair. Nonetheless, a number of locals, many associated with the anti-rail group Trail Now, voiced their anger at using federal funds to repair the washout, although many locals voiced their continuing support. 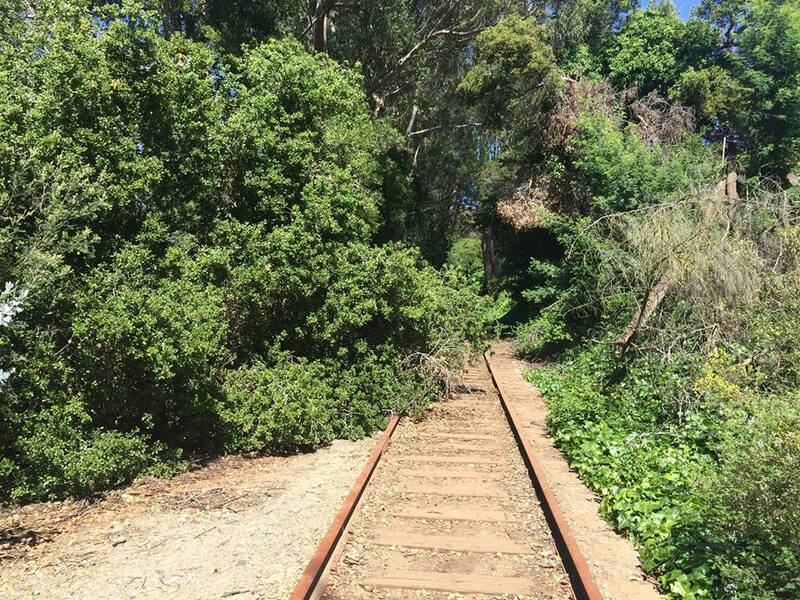 A tree fallen on the tracks in May from the January-February storms near Portola Avenue in Capitola. Photograph by James Long. An additional proposal was made at the May 18 meeting of the RTC which recommended measures to combat the fourteen downed trees on the line. The committee approved a $10,000 agreement with local firms to remove the trees. The trees have all since been removed and travel between Watsonville and Santa Cruz is possible again. Currently, the primary source of income for the county's railroading operations is railcar storage and railcar deliveries to Big Creek just outside of Watsonville, although there are other smaller patrons considering using the line. Minor damage along the Santa Cruz Big Trees & Pacific Railway line slowed Roaring Camp operations throughout the spring season but the line has since been fully repaired. The late season rain storms not only caused washouts at the railroad, but also Swanton Road. Consequently, Al Smith Day, an event celebrating our founder’s April birthday, was canceled. Because the railroad is adjacent to an important riparian habitat that is the subject of many studies, permits from numerous agencies are required in order to assure that repairs are made in an eco-friendly manner. This has provided volunteers the opportunity not only to plan and rebuild a section of the railroad but also learn about the ecosystem. Volunteers and guests are welcome on scheduled workdays (see Timetable below) and by appointment on other days, including weekdays. You can find updates on Facebook at www.facebook.com/SwantonPacificRailroad and sprr.calpoly.edu. 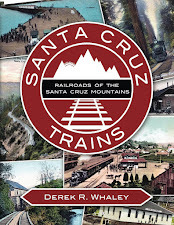 Derek R. Whaley's book Santa Cruz Trains: Railroads of the Santa Cruz Mountains (2015) was quietly updated to the Fourth Revision in May to fix two issues discovered by readers. The GPS coordinates provided throughout the book for railroad stops and tunnel portals have been reorganized so that they can now be used on Google Maps without modification. Previously, users would have to move the hemispherical coordinates (N, S, W, E) before results would properly appear. The second issue, pointed out in a recent book review by Railroad History (Spring-Summer 2016), rewords all instances of the term "narrow-gauged" to "narrow-gauge" to reflect current usage. Page 65: Photo caption changed from "boxcar" to "caboose". Page 110: Corrected "rarely-used" to "lightly-used". Page 200: Map updated to correct trackage. Facing restrictions to its scope, the Unified Corridor Study by the Santa Cruz County RTC, now in Phase 2, has been expanded to encompass the entirety of the Santa Cruz Branch line to Watsonville Junction in Pajaro. The 2012 study was commissioned to research ways in which portions of the Santa Cruz Branch line, Soquel Ave/Dr, and State Route 1 could be optimized to reduce traffic stresses in the county. However, the railroad route to Davenport and to Pajaro was not originally included in the study. The range of State Route 1 within the study is also now expanded to the Monterey County line and Davenport. Other aspects of the study to be improved include scenario analysis of various transportation options, performance measures regarding the sustainability of each route, and improving public transparency. The expansion of the study requires an additional $500,000 from Measure D funds. The commission approved the proposal at the March 2 meeting despite some opposition from the public. An environmental impact study for the rail trail along the Davenport portion of the Santa Cruz Branch line was approved at the RTC meeting on April 6. The commission needs to conduct such a report before section qualifies for funding from Measure D. Construction on the section must begin no later than 2020 to qualify for funds. Continuous – Howard Cohen has continued to share his photographs of the Santa Cruz & Monterey Bay Railway's daily operations, including numerous photographs of the repair work on the line. Bill Dawkins, meanwhile, has shared a number of photographs and videos of both current and historic area railroad lines. Mar. 1 – Tom Clark shared a YouTube video (link) showing the Southern Pacific's Santa Cruz local in 1983. Mar. 10 – Cohen shared a link to the Turrill-Miller Photograph Collection, which includes photographs of Manresa beach, its trestle, and its station. Also, Paul Pritchard shared a photograph of the last Big Trees Picnic Train passing the Boardwalk in 1965. Mar. 16 – Eddie Sims shared a photograph of the Capitola railroad bridge from 1938. He posted another photograph of a Santa Cruz local from 1948 on Mar. 30. Mar. 30 – Trevor Park also shared a new video (link) from Treefrogflag Productions focusing on the seasonal Polar Express train. Apr. 10 – Dawkins posted a 2008 video (link) of a train derailment on the Permanente line. Apr. 13 – William Turner asked about the length of railroad tracks, prompting Dawkins to reply with 39-feet for most lines, a number Brandon McShane backed up. Apr. 14 – Ian Applegate shared an advertisement by Roaring Camp from 1987 promoting the beginning of the annual Beach Train to Santa Cruz. Dawkins also informed the group that a house overlooking the old Pacific Mills logging railroad of Love Creek Road in Ben Lomond was for sale. Apr. 18 – Janie Soito shared an advertisement and timetable for the Pajaro Valley Consolidated Railroad from 1904, inadvertently assisting in site research. Apr. 24 – Len Klempnauer shared a c. 1950 photograph of a parade organizing in the Santa Cruz Union Station parking lot, where most parades began or ended. Apr. 26 – Craig Polson shared an old photograph of the Brookdale truss bridge over the San Lorenzo River. Derek Whaley also shared a public letter from the Trail Now group which intends to cause a delay in returning passenger service to Santa Cruz County. Apr. 29 – Brian Liddicoat reported a successful trip visiting remnants of the Boulder Creek Branch. May 2 – James Long informed the group that a number of trees are still down on the tracks near Portola Ave.
May 3 – K. Mikael Wallin shared an artistic photograph of the right-of-way near Capitola. May 11 – William McKay reminisced about a garden railroad he remembered from near Villa Montalvo. May 20 – Barry Scott shared a list of five things people can do to promote local rail transit. Complete the Unified Corridor Study survey distributed by the Santa Cruz County Regional Transportation Commission (link). Sign the petition to build the trail, but leave the rails. Send an email of support to info@sccrtc.org. Subscribe to one of the RTC topic pages. Share the above with your Facebook friends. May 22 – Soito shared a promotional map of Rob Roy at the Sea from the 1920s. May 25 – Park shared a new video (link) from Treefrogflag Productions of the Santa Cruz Beach Train. May 31 – Soito shared a photograph of the Santa Cruz freight yard in the late 1930s during a busy summer day. Ride Thomas the Tank Engine™!